The Grassroots Award supports local youth community projects using sport and cultural activities to create positive social change in hard to reach, marginalised and refugee communities. 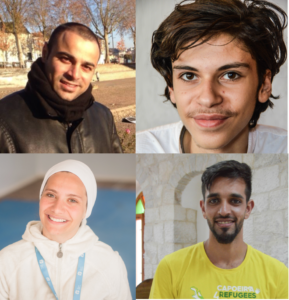 Dania Abu Halima, Abed Abu Garbia, Abdullah Berzawi, and Ahmed Shweiki have won an exciting new Award to help them grow local community projects in Palestine Jordan, and Turkey. Projects include an orphanage and youth community centre in Area C, the West Bank, a centre for refugees in Istanbul Turkey, and a women’s centre in Amman, Jordan. The Award supports local Changemakers through an education and training programme that caters specifically to the needs of young people living through and impacted by violence, conflict and war. “We work with kids who are likely to do drugs, get caught up in extremist groups, females who live in a culture where being active is a stigma.” Says Founder, Tarek Alsaleh. The Award also supports with mentoring, real time data collection, a network of support, and funding. Reaching out to female students is a fundamental part of the Awards vision. The Award will be opening up to Changemakers working in Europe in August 2017. Capoeira4Refugees is an award-winning NGO using sport, music and play to support refugees and conflict impacted young people. Founded in 2007, it has been running programmes in partnership with the UN, Norwegian Refugee Council, and Brazilian Government. C4R currently has projects running in Azraq and Zaatari refuge camps, in host communities in Jordan, its Changemaker Programme and its global network of Changemakers. C4R has reached over 60,000 refugees, worked across 20 different refugee camps and 60 communities impacted by war.